As I’m lamenting cold weather, there is something wonderful about fall in Paris. The best time to visit Paris is actually September because the weather is still a little warm and tourist season has come to an end. And it’s easier to go to beautiful sites like Giverny! Only 45 minutes away from Paris by train, this little town is a must for all coming to Île-de-France. Giverny is a very small town that became famous when painter Claude Monet passed it on a train one day and decided he wanted to live there. Soon after, Monet moved his family into the house of Ernest Hoschedé. Monet then started an intense love affair with Alice, Hoschedé’s wife, and the land that would become the now famous Japanese water garden. Visiting Giverny in the summertime is extremely beautiful but also crowded with tourists. Friends who have gone during this time have told me long queues ruined their experience. Me, being the internet monster that I am, scoured many travel forums to discover that Monet’s gardens are still in bloom until early October. While the weather is still tolerable, there are frequent (but very light) rain showers in September. Taking my chances, I took Petit Copain on a surprise birthday trip to Giverny. 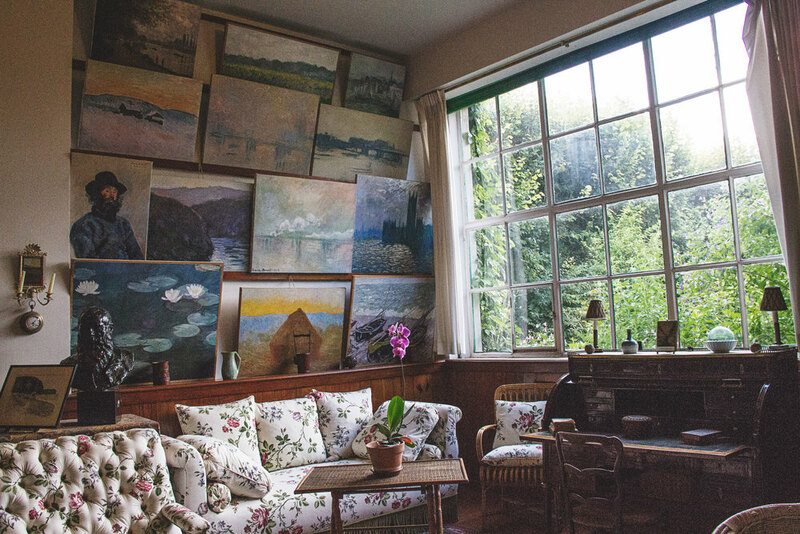 Going to Monet’s house is quite a journey. We wanted to take our time exploring the area, so I booked a hotel in the nearby town of Vernon. Then, instead of taking a tour bus, Petit Copain and I rented some bikes (terrible ones… make sure they have air in the tires!) at a café in front of the Vernon train station. Biking to Giverny from Vernon is very, very easy. You must cross two “busy" streets in Vernon until you get to the Seine. After that, it is all small streets and then a very long bike path. However, I'm terrible at riding bikes even though I love riding them. Poor Petit Copain had to take care of me and make sure I didn’t fall over. In LA, riding bikes on the busy streets is like a death sentence. It just isn’t a very bike friendly city. This is why I'm so afraid of cars. Petit Copain is working on this, slowly but surely. After our rough start, we crossed the Seine and took an immediate left to have lunch in front of the old watermill. The most interesting part about this area is not really the watermill, but the nearby remnants of the former Vernon bridge that spanned across the Seine River. Destroyed by the French Resistance during the end of WWII to deter German soldiers, you can spot the leftover debris and columns of the old bridge from this park. For our picnic, Petit Copain and I had a special meal. Earlier that morning, we went to the Vernon farmer’s market that happens in the city’s main square. 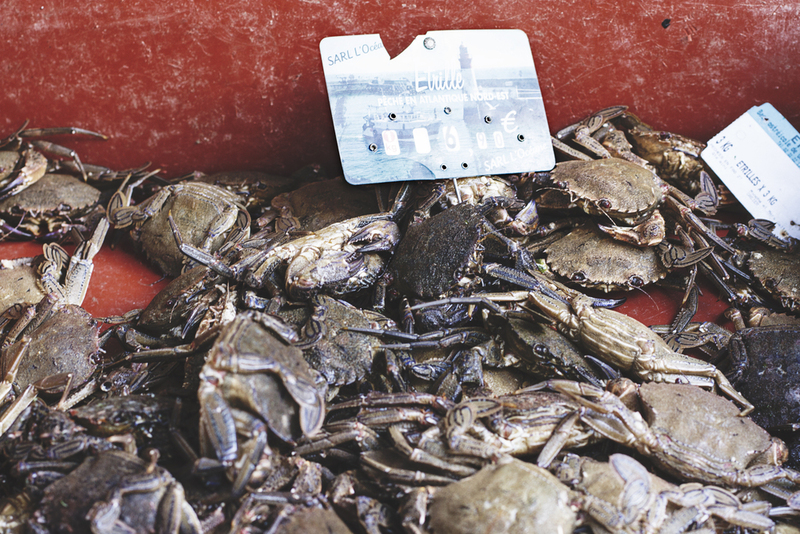 You can catch the market on Wednesday and Saturday mornings. We bought bread from this wonderful boulangerie next door, called “Ma Brioche”, as well as cheese and dried meats from the market, to make sandwiches. 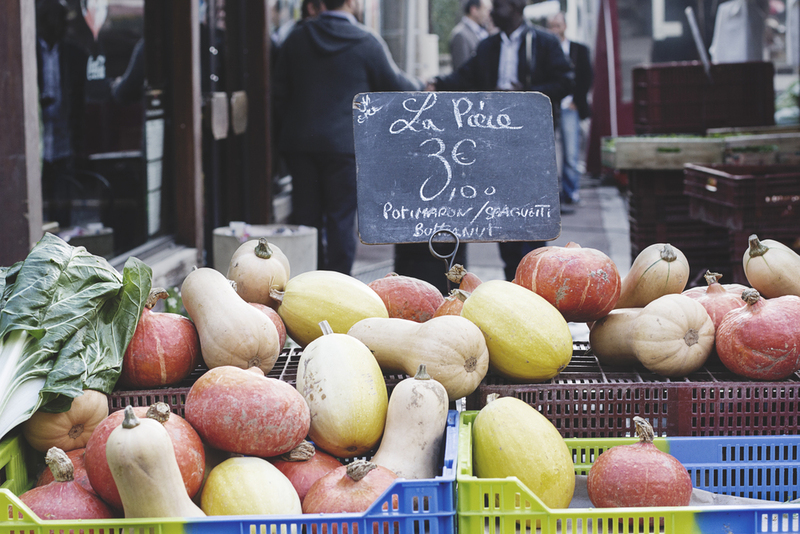 The market itself is amazing, as many vendors are actually farmers selling their own crops. You know from my second post how much I love produce from the region of Eure! The fresh fruits and vegetables are quite delicious and you won’t see too many out-of-season products here (like avocados… sigh….). Once lunch was over, we followed the signs toward Monet’s house. It rained a little on the way but it didn't last long. Monet’s house and gardens are worth the trip. Giverny, which is even smaller than Vernon, is very nostalgic of a different time in France. 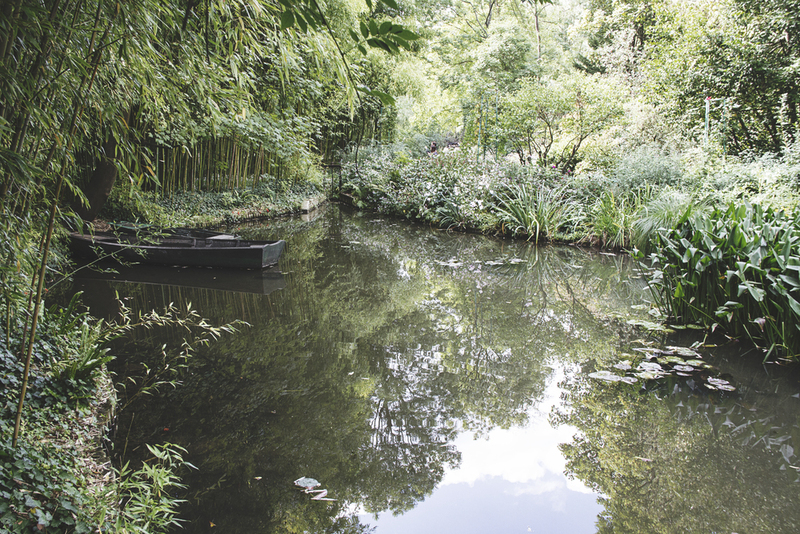 While you do have some tourist traps, Giverny still has the air of a small country town. 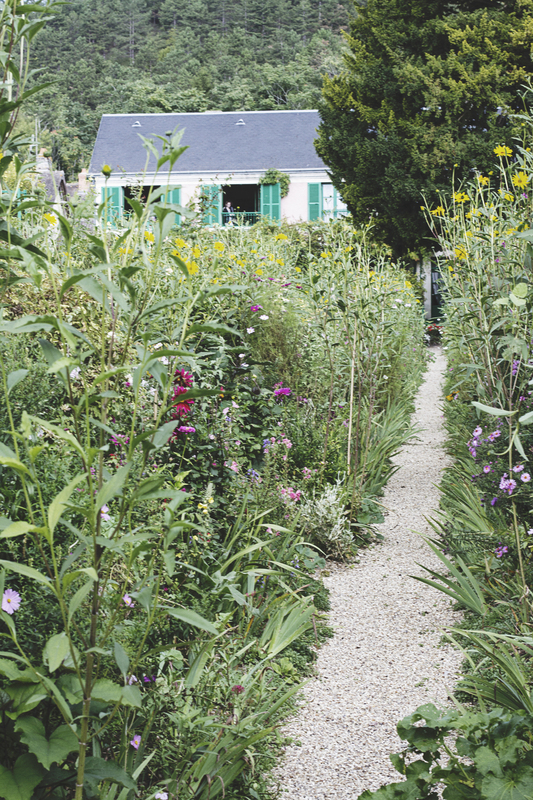 Monet’s house is surprisingly big and his flower garden is a huge tangle of beautiful bright blossoms and aromatic herbs. You also have the stunning water garden, complete with a Japanese bridge. One of the things I loved most about my trip was Monet’s kitchen. 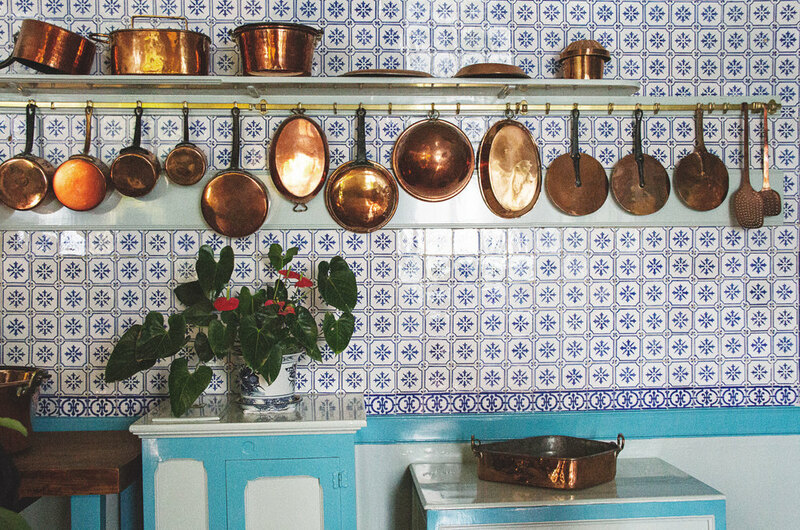 Just look at those copper pots… and those tiles! Perfect for roasting a chicken and preparing some vegetables. I also fell in love with the blackberries we encountered on the bike path. Wild blackberries are a little more tart than commercial ones. And there’s something very satisfying about searching for and picking your own berries. Blackberries are abundant on this bike path from late August to early October, so if you encounter them, please taste some! Blackberries turn black when they are ripe and the ones that are still white or red colored won’t be very tasty. Make sure to pick the berries with many drupelets (the round bumpy things). There are other types of berry bushes nearby but these berries are not edible. After my trip to Giverny, I felt very rustic... wanting to cook roasts and snuggle up next to a Monet-style fire place while it rained. In honor of Monet and his kitchen, I bought the last of the in-season tomatoes and some chicken from my favorite Paris market vendor. 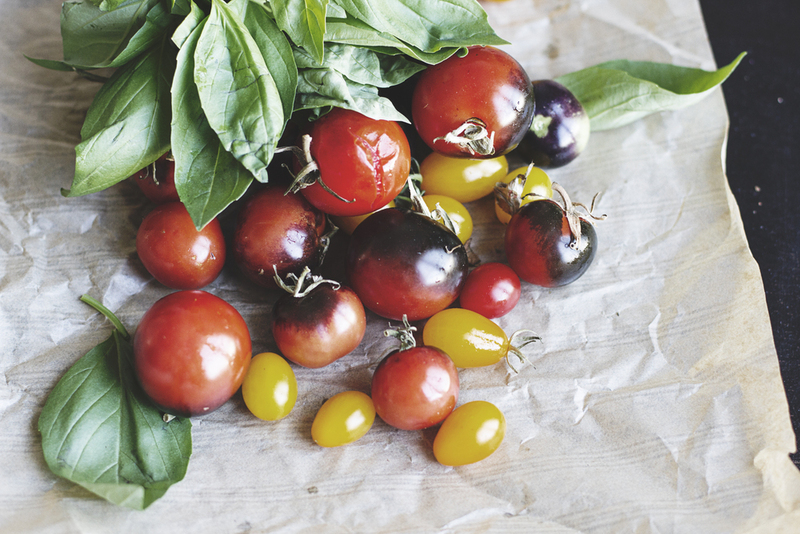 These tomatoes were quite spectacular in color as they were in taste. Cutting into one, you can see that the inside of this tomato is a deep, purplish red/orange. We also bought our favorite salad to go along with our roast chicken, which is a mix of wild roquette (arugula), dandelion greens, and some collard greens. And I couldn’t help myself… I had to add avocado. With winter approaching, I’ll have to abstain. Our free-range chicken was quite fabulous. We asked for half a chicken because it was such a huge bird. And… it was…. too fresh! Yes! You read that right! This is a serious problem. Chicken can’t be tender if it has been killed recently. When you cook really fresh chicken, it is too tough to eat because the flesh is still stiff from rigor mortis. You need to let the chicken decompose or break down a little bit before cooking. 2 days after slaughter is best. Now here comes the fun part! Roasting the chicken! Mimi Thorrison has a great chicken recipe here, and I’ve incorporated some of her suggestions into my own recipe. You can use any of your favorite herbs. 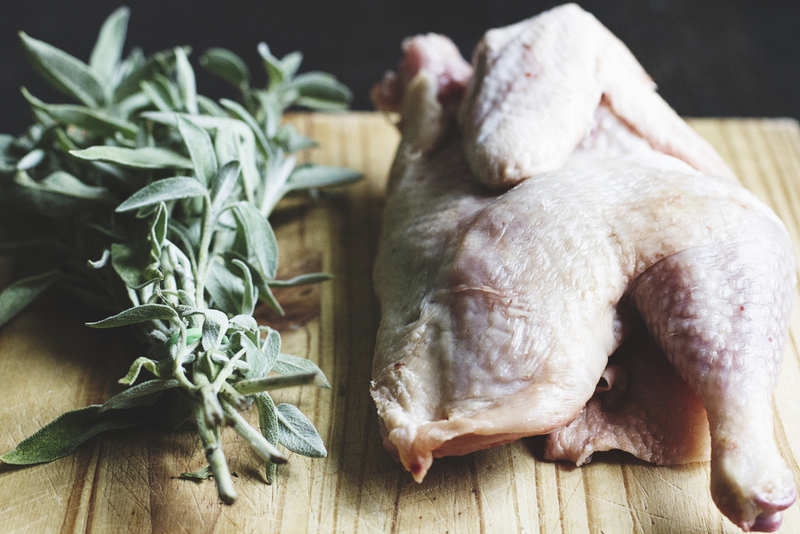 Traditionally, French chicken roasts include thyme, rosemary, and sage— which I definitely use with my chicken. I also use hyssop or sarriette (savory) when it’s available. 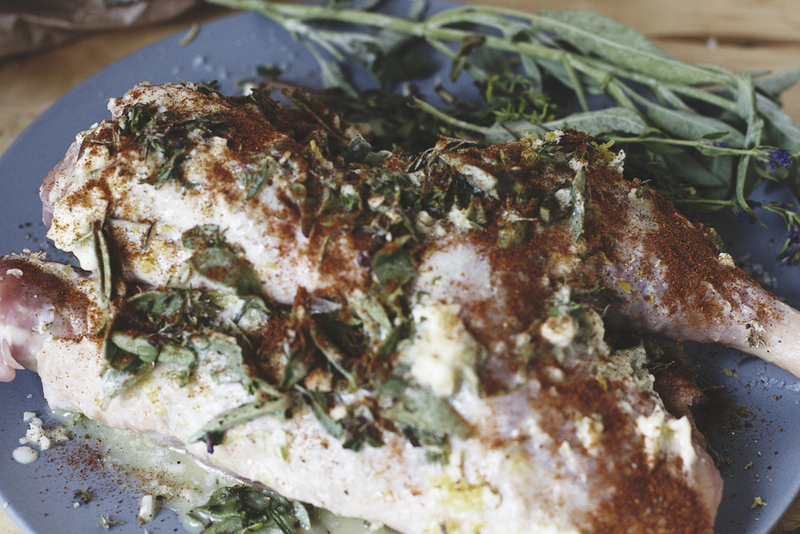 For a truly infused flavor, I use fresh chopped herbs and lemon zest. 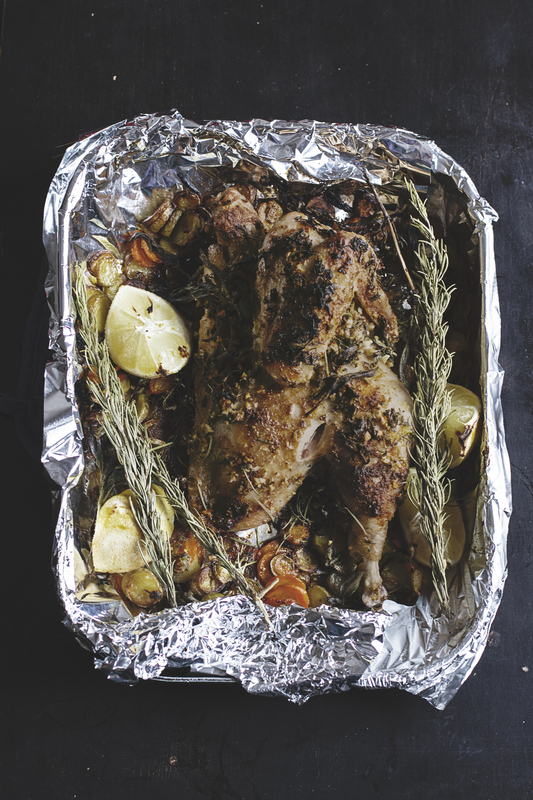 If you want a more simple roast, try using just thyme, lemon zest, and paprika. The boucherie we usually go to adds parsley at the end of the roasting process. All of these combinations are very tasty. Petit Copain loves to roast our chicken with carrots, onions, and potatoes. This is entirely optional though. If you do what Petit Copain does, you will need to bast these vegetables with the juices of the chicken while cooking to make sure they don’t dry out. Pre-cooking is highly recommended for the potatoes. 1. Rub the 2 tablespoons of butter or olive oil all over the outside of the chicken. If using a whole chicken, add the last tablespoon inside the cavity as well as one of the lemon quarters, the crushed garlic clove, and some salt. Next, rub lemon zest, chopped garlic, coarse salt, and pepper into the skin. Strip off some of the thyme and rosemary and crush/chop into little pieces. This will release the flavor of the herbs better. Sprinkle the loose leaves over the chicken. Crush and chop up a little of the sage and also sprinkle over the chicken. Top off with paprika if desired. Stuff the rest of the herbs into the chicken cavity and place the rest of the lemon quarters around the chicken. Cover chicken loosely with foil and let sit for two hours or so until the chicken has come to room temperature. 2. If adding carrots, onions and potatoes, now is the time to pre-cook the vegetables on the stove. On medium heat, cook potatoes first for 8 to 10 minutes and then add the carrots. After 4 minutes, put in the onions. Sauté until vegetables are slightly soft and the onions have begun to turn translucent. Add the vegetables into the pan, surrounding the chicken. 3. Once the chicken has reached room temperature, set your oven as high as it will go (about 250C or 450F). Once the oven has reached the correct temperature, put the chicken inside. Let the skin start to turn a nice shade of golden brown (5 minutes). Reduce heat to 200C (290F) and continue cooking the chicken for another 40 minutes. This isn’t my best picture, but you can see how delicious this chicken was! Does it evoke warm fireplaces and rustic living? Can you see Monet eating this roasted chicken? I hope you enjoyed my adventure. Until next time!